The Opposition Alliance has lamented the continued detention in police custody of its media chairperson Sean Tembo for two days without any charge. Alliance chairperson Charles Milupi said that his Alliance was disgusted that the police had arrested and detained Tembo without any charge. Speaking when the Alliance gave solidarity to Tembo this morning at Lusaka Central Police where he has been warned and cautioned, Milupi reminded the Zambia Police that Tembo was a citizen of Zambia. And GEARS executive director McDonald Chipenzi has asked the Chief Justice to constitute a medical board as provided for by law to ascertain Sean Tembo’s alleged defamatory statement against President Edgar Lungu. Chipenzi said that police should not have arrested Tembo but allow the Chief Justice to constitute a medical board to ascertain the truth of Tembo’s Facebook statement. “If it is the defamation of the President, the Chief Justice must be allowed to constitute a medical board as provided for by law to ascertain the truth because the evidence of his allegations can only be after an inquiry. Anything else outside the inquiry or tribunal or medical board as provided for in Article 107 of the Constitution is mere political talk which is and cannot be criminalized,” Chipenzi stated. He stated that Tembo’s arrest was evidence of shrinking civic and political space and “a testament of how police actions do not take the provisions of the Constitution as contained in Article 193, that of respect and upholding citizens’ human rights” and “clear abuse of the archaic defamation clause in our laws”. “We need to interrogate the constitutionality of this clause in terms of freedoms of opinion, expression and dissemination of such opinions as we continue to bemoan the shrinking civic, media and political space in Zambia,” stated Chipenzi. Meanwhile Milupi, who is also ADD president, stated that the Zambian constitution was very clear that no citizen should be arrested and detained before thorough investigation was done. He stated that the Opposition Alliance was now wondering why Tembo who is Patriots for Economic Progress (PeP) leader, was still detained while the police were continuing with their investigations. And opposition UPND leader Hakainde Hichilema had observed the need for Zambia, a country that calls itself democratic, to respect the rule of law. 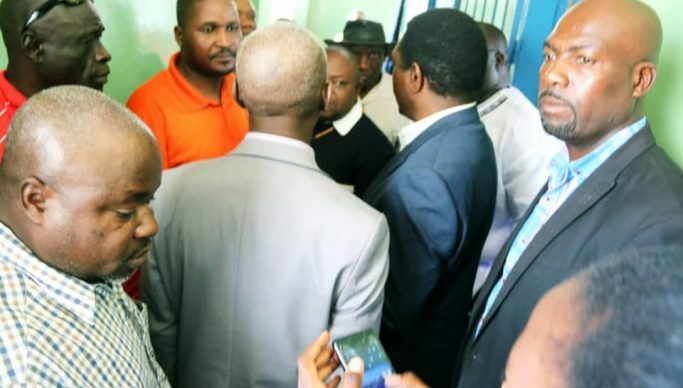 Hichilema said that the arrest and detaining of Tembo without charging him with anything was a clear demonstration of the breakdown of rule of law in the country. He stated that the correct thing the police should have done as opposed to picking him up like an armed robber from his home, was to send a call-out to appear for questioning. Hichilema said that it is unconstitutional for the Zambia Police to detain a suspect beyond 24 hours without charging him with an offense. Other Opposition Alliance leaders that were present at the police station to give Tembo solidarity were NDC consultant Chishimba Kambwili and NAREP president Elias Chipimo. Tembo is reported to have been arrested for allegedly defaming President Edgar Lungu.